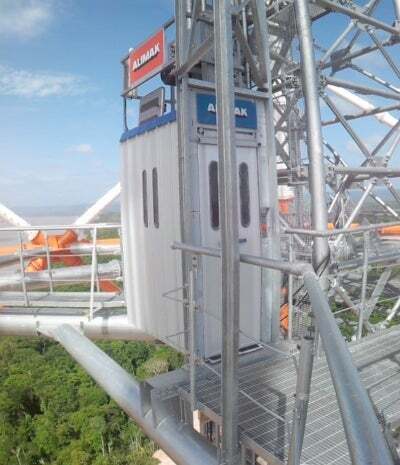 Alimak installed two elevators in transmission towers along the Amazon river. The rack and piston elevators will provide vertical access to two tubular towers carrying a 500kV power cable across the Amazon river in Brazil. The rainforest is located near the equator and the climate includes extreme heat, humidity and heavy rainfall. With the nearest village an hour away by speedboat, the environment would prove challenging for any elevator company. Alimak rack and pinion elevators climb to the top of the highest structures around the world, as they readily adapt to extreme environments. At 295m, the transmission towers are the tallest of their kind in South America. With three 500kV and two 230kV power lines, the systems stretch 1,240km through the Amazon rainforest. Each elevator reaches lifting heights of 288.6m and feature Alimak Hek’s proven rack and pinion drive system. Alimak Hek takes great pride in participating in the project, having been awarded the contract for supply and installation of two rack and pinion elevators by contractor, Isolux Corsan. Commissioned and installed in March 2013, the elevators allow service and maintenance personnel to access power cable stays and aircraft warning lights located on each tower. Alimak elevators are designed to operate in the most demanding of industrial environments around the world, both outside and inside building structures. The Alimak rack and pinion drive system has advantages over wire rope and hydraulic elevators. By carrying its own machinery, the Alimak elevator does not require an expensive machine room or load-bearing elevator shaft. The rack and pinion elevator also offers a safety advantage over traction elevators: in a power outage, the car uses gravity and a centrifugal brake system to slide back to the nearest landing at a controlled speed. Should the elevator car exceed the rated speed when descending, the car is stopped automatically by the Alimak safety device. The Alimak range of industrial elevators offers capacities of between 300-2,400kg and features 30 different standard car sizes, up to a maximum 1.56m by 3m. Travel speeds of up to 1.0 mile per second may be reached, with maximum lifting heights of 250m achievable with the standard accessories. Specially-designed elevators with capacities of up to 24 tonnes and 645m lifting heights may be supplied on request. Alimak Hek has considerable experience of installations within the power industry. Our elevators can be found worldwide on chimneys, silos, boilers, scrubbers, absorbers, precipitators and more. They are ideally suited for operation in even the most extreme environments; the durable nature of the Alimak SE range has made it the perfect access solution for the most demanding conditions. From the freezing and exposed conditions of the Antarctic and Iceland, to the extreme heat of the Australian desert, our elevators are built to last in world’s toughest environments.